I recently returned after four weeks photographing the Southwest. My main purpose was to photograph wildflowers in Southern Arizona. I would be visiting the Arizona deserts such as the Sonoran, Organ Pipe Cactus, and Saguaro. I have been trying to shoot wildflowers and cactus together for the last couple of years but to no avail. This year turned out to be the worst year on record for wildflowers in Arizona. Realizing there was no sense waiting around with nothing to shoot. 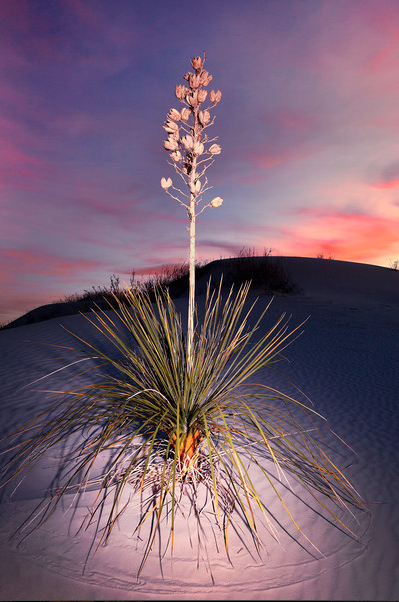 So I decided to head East towards New Mexico to photograph White Sands National Monument. I have always wanted to visit here but never had the opportunity due to time restrictions. So I made the twelve-hour journey straight to White Sands knowing at least I could not go wrong with sand dunes. I made it there for sunset with an hour to go after leaving Page after sunrise. The first thing I did was park in the car in the first available place and jump out to scout some possible Yucca plants to shoot for sunset. After five minutes of scouting I realized I was lost and no idea from what direction I came from. If you have ever been here everything looks the same in all directions. I started to freak-out and panic but I got my act together to shoot something for sunset and then I would worry later. As the sun disappeared and the sky got dark, my panic kicked in. After eventually walking in all directions I finally hit the roadway but now which direction was the car… as expected the park was now closed and a ranger had luckily found me. So I had learned a valuable lesson about using GPS’s. It doesn’t work so well if you leave it in the car. So I decided I was going to stay here for at least four days until I got something I was happy with. I had done some research so I knew that sunrise was out of the question if you are not camping. Things have been revised here and now there is no car camping at all so I would have to forgo on the sunrise and settle for a couple of sunsets here. 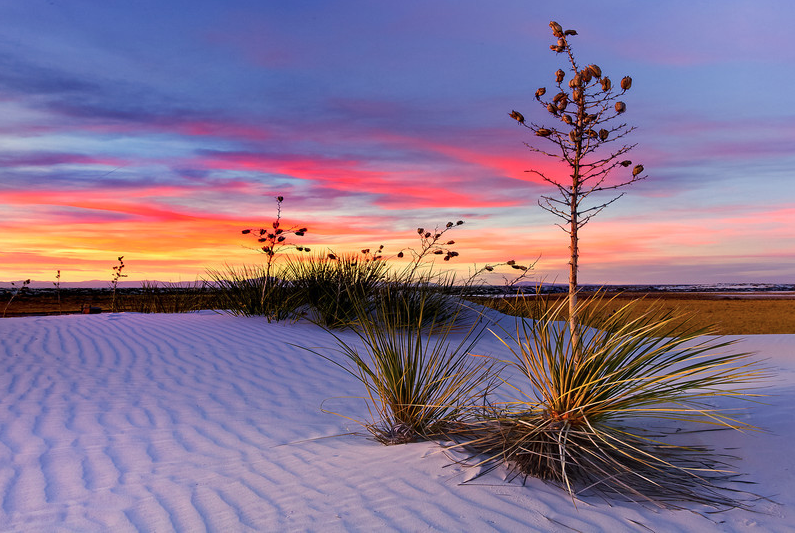 White Sands opens just after sunrise and closes about 90 minutes after sunset. 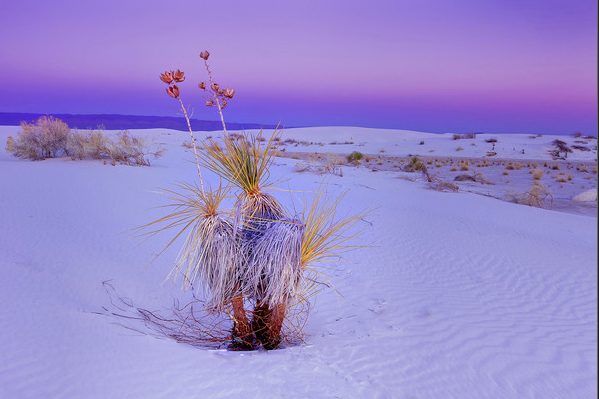 To photograph White Sands ideally you want to shoot thirty minutes before sunrise and be setup at your location; this is impossible to make if you are not camping. But the rangers give you ample time after sunset to return to your car as long as you remember where you parked it. 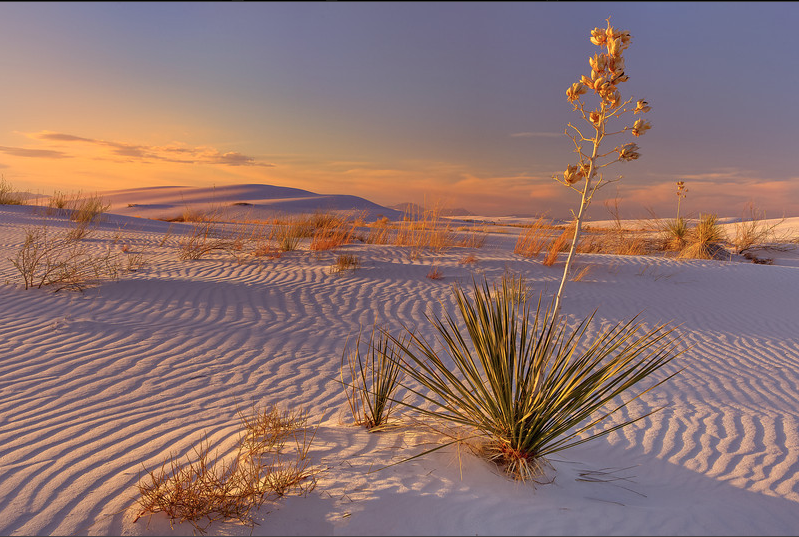 White Sands is broken down into roughly three parts roughly ten miles long in total. The first part is mostly vegetation, second is the Yucca plants, and lastly the third part was all sand dunes. Each area offered something completely different. I used the day to hike everywhere and really nail a location for sunset. The real secret to this place though was after the sun went down; the warmer colors in the sky that reflected off the white sands well into the night really stood out. You often hear how important it is stay after sunset but this was a special treat for those who should patience. The thing that really surprised me was how hard to was to find single Yucca plants that were not dead, falling over, or discolored. I walked all day and found only a handful of Yucca plants. So if you get a chance to visit here plan a extra day to scout for possible places to shoot. Over the four days I was there I was met with stunning sunsets every night and never ran out of things to shoot. 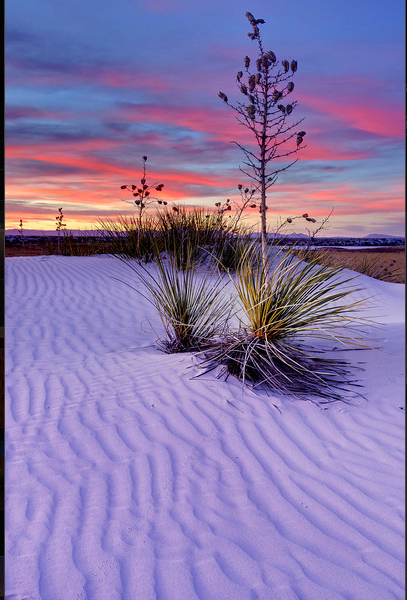 I highly recommend White Sands for anyone who shoots landscapes. 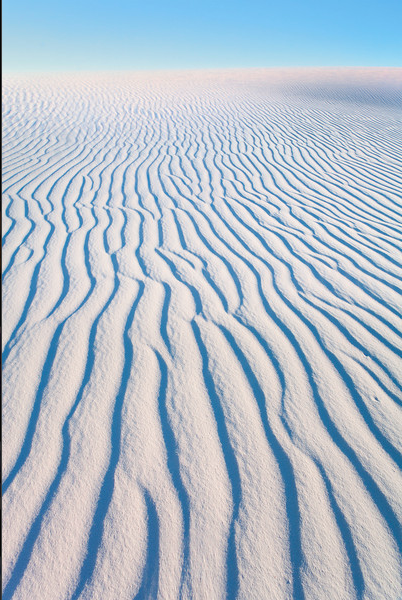 Some tips that really helped me in White sands was to look for leading lines such as the ripples in the sand. 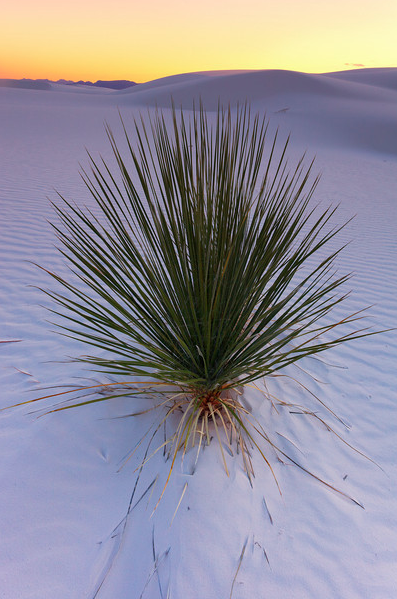 They would be hard to find due to the foot traffic and so time was needed to find both the combination of a Yucca plant and leading ripples. I also found advantages to using a low perspective with the camera and getting the camera as close to the ripples; I wanted to exaggerate the size of the ripples by placing the camera as close to the ground as possible. 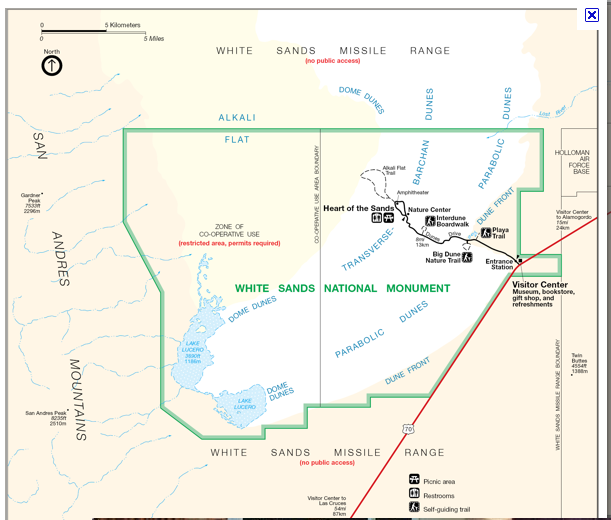 If you get a few days to visit here the Alkali Flat Trail is a must for anyone who likes to hike; but avoid the mistake I made thinking is was cloudy enough to not wear a shirt or sunscreen. (I spent the rest of the trip burnt like a lobster unable to even wear a backpack). The second place I recommend you visit is the often-overlooked vegetation section where if you hike out far enough you will find some great flora and solo trees in the middle of nowhere. 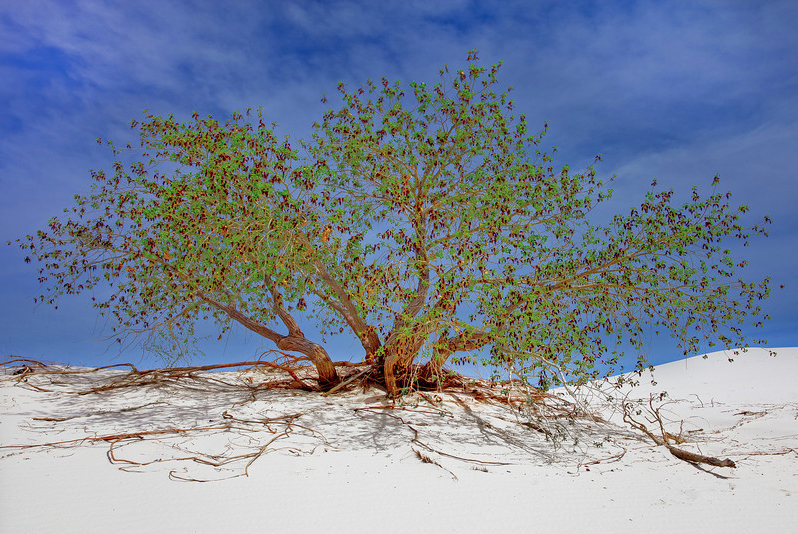 The bright flora contrasts nicely with the white sands and makes for some impactful images. I highly recommend spending at least a few days here increasing your chances of a great sunset. Spend some time in the sand dunes looking for higher elevations to use your telephoto lens. With some national parks you can get good images anywhere but not here. Hard works really pays off in terms of scouting out locations to photograph. The visitor center was extremely helpful in getting me started. If you really get on good terms with the ranger they will open the gates early for you but still a rush to make sunrise. 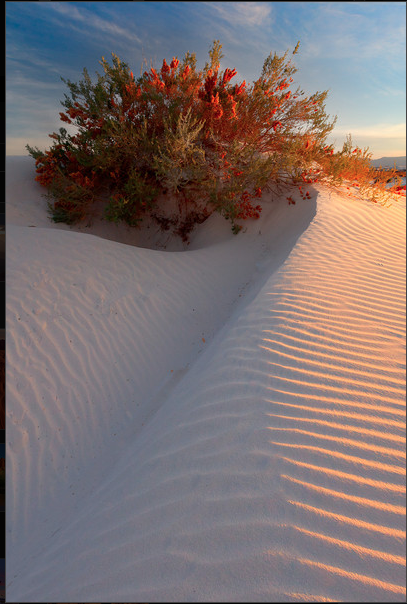 Lastly, if you have tips about White Sands that I have not mentioned please let me know. ~ by photocascadia on April 25, 2011. Beautiful pictures Kevin! And a great story. Do not forget GPS in car…. check! Sweet post. I really enjoyed all your photos posted here. I was hoping to meet up with you while hanging with Justin Reznick in Page earlier this month. I think you were in Monument Valley and Bisti at the time. Anyways, I like your photo entitled, “Nothing Like the Warmth of the Last Rays” the best. I think that dune in the background gives the image some nice depth and I also like how you separated the foreground and mid-ground elements. Out of curiosity, what did you do for sunrise every morning? Also, are you allowed to backpack on the dunes? Well, thanks a lot for sharing this post. I hope you made it home safely. Quite a nice collection of images! Looks like you employ supplemental light from time-to-time. I like the effect. I understand you were there in the springtime – what month specifically? I may be headed down to White Sands in mid-June – when I suspect it will be devilishly hot.